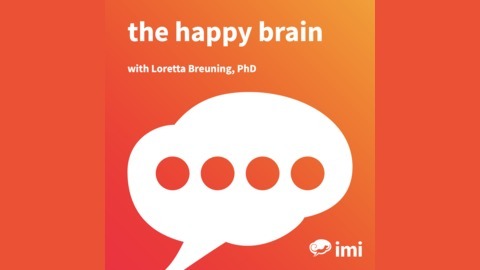 Do you wonder what stimulates your happy brain chemicals- dopamine, serotonin, oxytocin, endorphin? 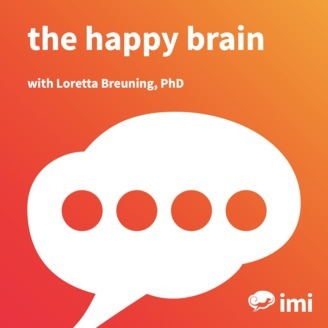 Answer your questions with these lively conversations between Loretta Breuning and real readers of her book, Habits of a Happy Brain: Retrain your brain to boost your serotonin, dopamine, oxytocin and endorphin levels. Still have more questions? Read the book and be a guest on the show yourself! Contact Dr. Breuning and learn more about her work at the Inner Mammal Institute at: InnerMammalInstitute.org. The brain chemicals that make us feel good are inherited from earlier mammals. They evolved to do a job, not to make you feel good all the time. When you know the job of each chemical in the state of nature, your ups and downs make sense. More important, you can re-wire yourself to enjoy more of them in sustainable ways. But it’s hard. Our brain is designed to release happy chemicals to reward you for steps that promote survival. But our brain defines survival in a quirky way: it cares about the survival of your genes and it relies on neural pathways built in youth. To make things even harder, our brain habituates to the rewards it has so you always have to do more to get more happy chemicals. We are not born with survival skills like our animal ancestors. Each newborn human wires itself from its own early experience. Happy chemicals are like paving on your neural pathways, wiring you to repeat behaviors that made you feel good before. This is why our urgent motivations don’t make sense to our verbal brain. It’s not easy being mammal! When you know how your brain works, you can find healthier ways to enjoy happy chemicals and relieve unhappy chemicals. You can build new neural pathways by feeding your brain new experiences. But you have to design the new experiences carefully and repeat them a lot. The Inner Mammal Institute has free resources to help you make peace with your inner mammal: videos, blogs, infographics, and podcasts. Dr. Breuning’s books illuminate the big picture and help you plot your course. You can find new ways to feel good, wherever you are right now. Music from Sonatina Soleil by W.M. Sharp. Hear more of it at InnerMammalInstitute.org/musicbywmsharp. Want to Be Perfect Someday or Better Now?